A garden auger made of thicker steel that stands up to harder ground. Your search is over. 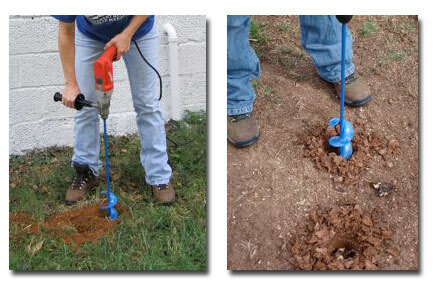 Our bulb augers and garden augers are designed for ordinary household drills. Although the primary purpose of a bulb auger is for bulb planting, there are a wide variety of uses for garden augers. Using different sized diameter augers, you can: dig holes for vegetable or flower planting, drill pilot holes for easier installation of tree or grade stakes, deep root water, aerate or liquid fertilize trees, and turn and aerate compost piles. Constructed of 100% cold-rolled steel, the 1.75'' diameter, 2'' diameter and 2.75'' diameter garden augers feature a sturdier 3/8'' shaft that is shaped at the end, providing a snugger fit in your drill chuck, eliminating slippage. Some of our garden augers come in a heavy duty version. This means the auger construction is the same as the regular garden auger, yet with an additional hardened steel cutter welded on to the bottom of the spiral, giving you a superior cutting edge for harder ground. You must supply your own drill to use with the augers. Typically any corded 3/8'' drill or larger will have plenty of power to drive the bulb planter. However, if using a cordless drill, it's best if your drill has at least 18 volts of power. The best cordless drills to drive the garden augers are the Milwaukee 18 volt cordless 1/2'' drill or the DeWalt 18 volt 1/2'' cordless drill. If you do not have a drill but would like to purchase one that would work with our augers, contact our office.